Sweet, savory chicken that will delight your family. So much better for you than Chinese take-out. 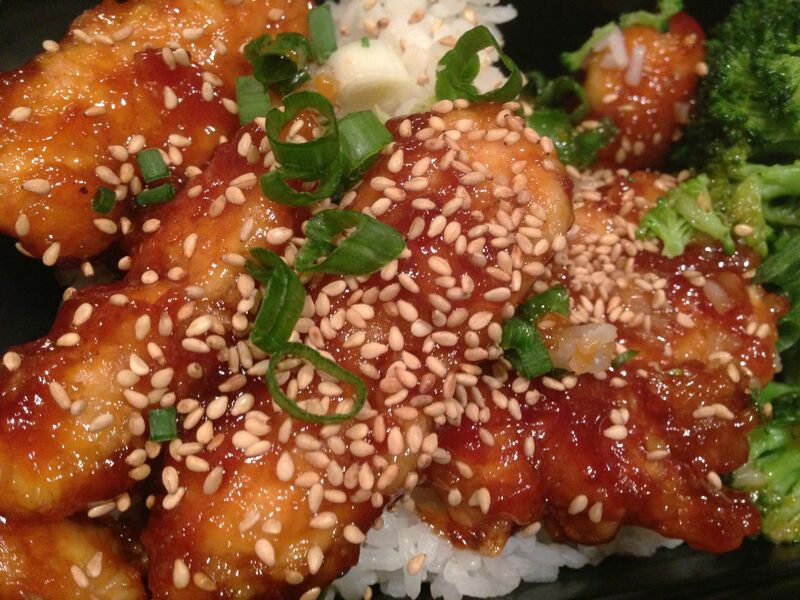 My kids love General Gau’s/Tso’s chicken or Sesame Chicken as a dish from Chinese restaurants. I always knew it was not a health dish, because it was likely rolled in flour and deep fried before being covered with a sickeningly sweet sauce. I also know that any time you can make something at home, you have better control over exactly how bad it is for bodies, for teeth, and for wallets. But the great thing for me about either going out for Chinese food or doing take out is that it’s something you can’t make at home. But trawling through the Internet, I found a great recipe for sticky sesame chicken here from the website Creme De la Crumb. The author Tiffany, took the recipe from a blog called Six Sisters Stuff, that called for using prepackaged popcorn chicken. I of course, have tweaked it further because I can’t leave well enough alone. I think 4 tablespoons of honey is fine (her recipe called for six) and I always insist on fresh steamed broccoli with it, so at very least I can kid myself it’s a balanced meal. I made this this year for New Year’s Eve and it was a big hit! I made it first with breast of chicken, but have since found that it can be made successfully with chicken thighs. This is so far it is the only way to get my kids to eat chicken thighs and requires that I trim the fat aggressively. Though it seems fancy, the dish is relatively easy to make and always comes out like the picture (above), which is actually my dish. All the versions of this recipe produce such equally good-looking chicken dishes is really a testament to its ease. You can do it! Even though this is dish is made at home, it’s still no diet-helper. It’s double dipped in flour and corn starch, and the sauce features four kinds of sugar (honey, ketchup, white and brown sugars). Still, it’s DELICIOUS and quick, and still great the next day. It’s really all in the timing. I recommend before you start, you set your rice in your rice cooker (this takes about 45 minutes) and trim and cut your broccoli. If you are going steam or boil it, prepare the pot and the water. For the chicken, I find it’s easier to do all your cutting before your dipping and coating. There were some omissions or points of interest in Tiffany’s recipe that I had to either correct or fill in for myself. Her recipe called for “one tablespoon of oil.” I tried that but found that I need a lot more oil to get the chicken cooked, and since I had to cook it in batches, I ended up using quite a bit more. At the end, I had a skillet with oil in it, but clearly that wouldn’t have been the case with one tablespoon, hence my direction to pour off the extra oil (but not the charred bits of chicken-stuff. Keep that, it’s good). That recipe also supposes I have a pan big enough to cook ALL of the chicken at once (since she never mentions taking it out). That’s not the case, and so I ended up cooking the chicken in batches, and then placing it on a paper towel to dry while I did the next batch (four chicken thighs took three separate batches). After all the chicken was done, I cooked the sauce and then returned the cooked and dry-drained chicken to the pan. Lastly, she did not specify what kind of oil to use. Usually I use canola oil for frying but in this case I added a little peanut oil as well. Did I say “not a health food?” Though high in fat, sugar and carbs, unlike a take-out chinese meal, there were no other dishes, and no fortune cookies, so at very least that was a calorie saving. And this week, we actually ordered the dish from our favorite Chinese restaurant and my kids voted mine better. So to recap: cheaper, faster and more popular. But still not a health food. 3 boneless skinless chicken breasts, or 4 chicken thighs, fat trimmed and cut into small pieces. Arrange in three bowls, the beaten eggs, corn starch, and flour in sequence. Cut the chicken; dip pieces in egg, then flour, and lastly in corn starch. Heat oil over medium heat in a large pan. Add chicken and cook, stirring throughout to ensure even cooking, 5-10 minutes until cooked though. You’ll have to do it in batches. If you have extra oil, drain off some of it. Combine corn starch and water until dissolved. Add sauce to pan and bring to a boil. Add corn starch mixture. Stir until sauce thickens. Add chicken pieces, and stir until completely covered. Place in a bowl and cover with sesame seeds and green onions. Posted in Meals and tagged chicken, chinese take out, general gao's chicken, general gau's chicken, quick chicken recipes, sesame chicken on January 24, 2015 by Robert Deutsch.